Ras Jua Baraka (born April 9, 1970) is an American educator, author, and politician who is the 40th and current Mayor of Newark, New Jersey. He was previously a member of the Municipal Council of Newark and the principal of the city's Central High School until he took an indefinite leave of absence to run for the 2014 Newark mayoral election, which he won on May 13, 2014. Baraka was sworn in as the city's 40th mayor at ceremonies at the New Jersey Performing Arts Center on July 1, 2014, for a four-year term. He won reelection in the 2018 mayoral race. A Newark native, Baraka is the son of poet and activist Amiri Baraka and his wife Amina. Baraka was educated in the Newark Public Schools and subsequently earned a BA in Political Science from Howard University in Washington, DC, and an MA in Education Supervision from St. Peter's University in Jersey City. He was principal of Central High School from 2007 until 2013. Baraka is editor of In the tradition: an anthology of young Black writers (1992). Baraka was featured on singer Lauryn Hill's 1998 The Miseducation of Lauryn Hill, as the narrator of several interludes on the album. He also recorded the intro to The Score, The Fugees' second album. Baraka and Hill recorded an unreleased single together entitled "Hot Beverage in the Winter", which later featured on his spoken-word album Shorty for Mayor. Baraka dedicated his collection of poems Black Girls Learn Love Hard to the life of his late sister, Shani Baraka, who had been fatally shot in 2003. He had read as part of the city's Dodge Poetry Festival. Since its inception in 2004 Baraka has participated in the National Political Hip-Hop Convention. Between 2002 and 2006 Baraka was Newark Municipal Council member and in 2002 was appointed deputy mayor, and served that position until 2005. In November 2005, Baraka was voted to complete the term vacated by the deceased Councilmember-at-Large Donald Kofi Tucker. In May 2010 he defeated then-councilman Oscar James II in a highly contested election, on a platform critical of Mayor Cory Booker. The election was documented on the Sundance reality television series Brick City, which stars Booker, Baraka and other Newark political and residential figures. Baraka ran his first campaign for mayor when he was 24 years old, in 1994. Baraka ran in the 2014 Newark mayoral election against former Assistant State Attorney General Shavar Jeffries, after fellow council members Anibal Ramos, Jr. and Darrin S. Sharif dropped out of the race. In August 2013, fellow council members Mildred C. Crump and Ronald C. Rice issued statements formally backing Baraka's candidacy. Baraka's slate for the municipal council included John Sharpe James (council member-at-large running for South Ward), Mildred C. Crump (council member at-large incumbent), Alturrick Kenney (at-large candidate), Patrick Council (at-large candidate) and Joe McCallum (West Ward candidate). In December 2013, the Communication Workers of America, a trade union which counts 2000 members living, and thousands more working in Newark, endorsed Baraka. In February 2014 he received the endorsement of former New Jersey governor Richard Codey and Jersey City mayor Steven Fulop. In March he was endorsed by 1199SEIU United Healthcare Workers East. On May 13, 2014, Baraka was elected mayor of Newark. Official results show that of 44,951 ballots cast, he received 24,358 to Jeffries' 20,593. He succeeds Luis A. Quintana, after completing the term of Cory Booker, who had resigned after being elected to the United States Senate in October 2013. Baraka was sworn in as the city's 40th mayor by former Governor of New Jersey Richard Codey at ceremonies at the New Jersey Performing Arts Center on July 1, 2014 for a four-year term. Soon after winning the election, Baraka had initiated meetings with Cory Booker on May 19 with Governor Chris Christie, and Essex Executive Joseph N. DiVincenzo, Jr. on May 21. Chris Christie has described Baraka as a "hostile guy". On May 28, 2014 Baraka announced his transition team, headed by former mayor Kenneth Gibson, comprising sixteen committees that will report to him before his inauguration. In the 2014 local elections four of the municipal council candidates Baraka supported won their races, leading the expectation that the elected body, in which he needs five votes on the nine-member council to get any proposal passed, will be cooperative to his agenda. His preferred candidates who won seats on the council last month include: At-large Councilwoman Mildred C. Crump, and union leader Eddie Osborne in the at-large race and At-large Councilman John Sharpe James in the South Ward race and Gayle Chaneyfield-Jenkins in the Central Ward race. Incumbents East Ward Councilman Augusto Amador North Ward Councilman Anibal Ramos, Jr. and At-large Councilman Carlos Gonzalez were also re-elected on Shavar Jeffries' ticket. Mayor Luis A. Quintana, who was elected to be an at-large councilman, ran as an independent. Baraka appointed his brother, Amiri "Middy" Baraka, Jr. as his chief of staff. During his tenure as mayor he has earned praise for improving Newark’s economic prospects. The mayor of Newark, New Jersey, has released details on a tentative agreement he's reached with Uber to operate in the state's largest city. The deal calls for Uber to pay Newark $1 million a year for 10 years for permission to operate at Newark Liberty International Airport, which serves the New York City region and is one of the busiest airports in the nation. The San Francisco-based company also will provide $1.5 million in liability coverage for all drivers in its network. The Newark Public Schools system (serving approximately 40,000 students) was placed under state control in 1994. Newark is one of 31 "Abbott", or "SDA district" which requires the state to cover all costs for school building and renovation projects in these districts under the supervision of the New Jersey Schools Development Authority. In 2010 Mark Zuckerberg, the founder of Facebook, donated $100 million of his personal fortune through his foundation StartUp Education to the Newark school system. Release of the funds required matching funds, which were mostly raised through the Foundation for Newark's Future and have largely been spent, though funds remain. The foundation was short-term philanthropic "shot in the arm". By 2015, FNF and its partners will have spent $200 million. [needs update] The donation precipitated an effort to reform and restructure the system. Teams of consultants have suggested numerous management reforms from the top down, but according to Ras Baraka, echoing concerns of many residents, they have ignored the community and the needs of children and wishes of families in the neighborhoods. A restructuring program called One Newark calls for the closure of some public schools and the opening of more charter schools (some in public school buildings). The reorganization, spearheaded by state-appointed Superintendent Cami Anderson, would relocate, consolidate or close one quarter of the district's schools that she has determined are underutilized. The plan has met with stiff resistance from large segments of Newark's population, with critics saying there's no evidence it will increase student performance. The plan would also include teacher lay-offs. While there is some agreement with many of the policies being implemented in the program, the disregard for community input and the pace of change has drawn criticism. The plan will require some students to leave their neighborhoods and travel across the city, with many parents fearing for their safety. Baraka ran for election with a campaign to take back local control of the schools. In May 2014, Newark, which already had control of operations (includes student transportation and other support services), was granted local powers over budget and finance, giving the local advisory board its first formal vote on the district's nearly $1 billion in annual spending. The state retains the right to veto any action of the local board and has the final say in appointing the superintendent of the district. Baraka as an outspoken advocate of returning control of the Newark's school to local authority has called for the ouster of state-appointed Superintendent Anderson. Anderson's contract was renewed in June 2014. A discrimination complaint filed on behalf of Newark parents and the Newark branch of New Jersey's Parents Unified for Local School Education (PULSE) claims that 86 percent of the students affected by "One Newark" changes are African American, while African-American students make up 51 percent of the entire district. The allegation is being investigated by the United States Department of Education's Office of Civil Rights. Baraka has called for the resignation of Cami Anderson, the state-appointed superintendent. Anderson resigned in June 2015. While Anderson's resignation made the situation less politically volatile, Baraka opposes the creation of more charter schools, and believes they come at the expense of public schools. In October 2013 Baraka introduced his program to deal with crime and gang violence in the city, the Ras Baraka Blueprint to Reduce Crime and Violence in Newark It includes "Project Chill", which incorporates elements similar to Boston's Operation Ceasefire and other engagement with gang members and intervention programs. As of June 30 there had been 43 homicides in 2014. In 2013 through June 30, the city recorded 41 homicides. A surge of violence in the second half of 2013 pushed the homicide total to 111, the most since 1990. In Fall 2014, Baraka started the Model Neighborhood initiative, which increased police presence in troubled neighborhoods. Between 2008 and mid-2013, 6,810 homes were foreclosed in Newark, and citywide, and homeowners in the city and lost roughly $1.8 billion in home values. At that time about 9,000 Newark residents were "underwater", where payment balances are higher than the fair market value of the property. In May 2014, Baraka introduced a resolution adopted by the municipal council that would affect an estimated one thousand Newark homeowners threatened with foreclosure, giving the city legal authority to purchase home with underwater mortgages through eminent domain and refinancing them. it is estimated that more than 50% of Newark homes are financed by underwater mortgages, partially as a result of the 2010 United States foreclosure crisis. The Newark Watershed comprises 35,000 acres of reservoirs and water treatment and supply systems for more than 500,000 customers in northern New Jersey including Newark and neighboring Belleville, Elizabeth, Bloomfield and Nutley. It is considered one of the city's greatest assets. A New Jersey State Comptroller report issued in February 2014 revealed irregularities and corruption within the Newark Watershed and Development Corporation, which is the process of being dismantled after being taken over by the city. In March 2014, Baraka called for a forensic audit of the agency. Despite protestations from the city council, in April 2014 a Superior Court judge ruled that the city must continue to fund the agency during the process. The United States Attorney for the District of New Jersey is investigating the matter. In August 2014, citing a $30 million deficit in the city's 2013 budget and an anticipated $60 million deficit for 2014, Baraka said that Newark would likely have to ask for emergency aid from the state, which, if received, would require state oversight and involvement in the city's financial affairs. As of September 2014, the state's Local Finance Board, overseen by the New Jersey Department of Community Affairs, had not taken action. That same month, the city auctioned properties, most of which had been foreclosed, in an attempt to raise funds. The state's Department of Community Affairs awarded Newark $10 million in transitional aid, which comes with a required oversight memorandum of understanding. The state will hire a private firm to oversee the city's financial management and compliance. The state will reduce budgets for the city clerk and expenses for council members as part of the agreement. In 2014, Baraka initiated a program, called Model Neighborhoods, intended to take a comprehensive approach to addressing the factors causing troubled neighborhoods. In November 2017, Baraka and his campaign treaurer were issued a 28-count complaint by the New Jersey Election Law Enforcement Commission, alleging they violated campaign finance rules in the 2014 mayoral election, mainly for failure to fully disclose the source of $396,000 in campaign donations in the expensive and tightly-contested campaign. ^ a b c d ""Baraka, Ras", Our Campaigns". Retrieved October 6, 2014. ^ a b c "City of Newark, NJ: Ras J. Baraka". City of Newark, New Jersey. Archived from the original on May 14, 2012. Retrieved May 22, 2012. ^ Dawsey, Josh (May 13, 2014). 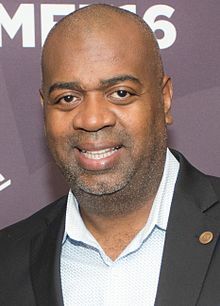 "Ras Baraka Is Elected Mayor of Newark". The Wall Street Journal. Retrieved May 14, 2014. ^ Nix, Naomi (July 1, 2014). "Ras Baraka to be sworn in today as Newark's 40th mayor". The Star-Ledger. Retrieved June 28, 2014. ^ NJ.com, NJ Advance Media for. "A 'humbled' Mayor Ras Baraka announces re-election bid in Newark". NJ.com. Retrieved January 13, 2019. ^ Checkoway, Laura (August 26, 2008). "Inside 'The Miseducation of Lauryn Hill'". The Rolling Stone. Retrieved August 31, 2012. ^ "Ras Baraka". Moore Black Press. Retrieved August 31, 2012. ^ Black Girls Learn Love Hard at Amazon. ^ "Ras Baraka". Dodge Poetry Festival. Retrieved December 2, 2013. ^ "Ras Baraka". NLLC. Retrieved May 28, 2014. ^ Giambusso, David (May 12, 2010). "Newark residents vote in highly contested council elections in South, Central wards". The Star-Ledger. nj.com. Retrieved May 22, 2012. ^ "COMING JANUARY 30 – ALL NEW SEASON OF BRICK CITY". SUNfiltered. Sundance Channel. December 17, 2010. Archived from the original on December 20, 2010. Retrieved May 22, 2012. ^ "Our Campaigns - Candidate - Ras Baraka". Retrieved October 6, 2014. ^ Giambusso, David (August 16, 2013). "Darrin Sharif announces run for mayor of Newark". The Star-Ledger. Retrieved November 26, 2013. Much of the economic development in Newark and a large stake of its business community operates in Sharif's ward, but its residential neighborhoods are among the most troubled. ^ Glover, Vivian (October 15, 2013). "Who will run Newark without Cory Booker?". The Grio. Retrieved December 1, 2013. ^ Queally, James (February 12, 2014). "Newark mayoral race narrows to 2 as another candidate drops out". The Star-Ledger. Retrieved February 12, 2014. ^ Pizarro, Max (August 27, 2013). "Crump and Rice endorse Baraka in Newark mayor's race". The Star-Ledger. Retrieved December 2, 2013. ^ "Newark mayoral contenders Ras Baraka, Anibal Ramos pick up union endorsements". NJ.com. Retrieved October 6, 2014. ^ Bonamo, Mark (January 7, 2014). "Newark mayoral slates start to coalesce". NJ.Politcker. Retrieved January 22, 2014. ^ Isherwood, Daryl (December 2, 2013). "CWA set to endorse Baraka in Newark mayoral contest". The Star-Ledger. Retrieved December 2, 2013. ^ "Newark mayor's race: Jersey City mayor Steven Fulop endorses Baraka". NJ.com. Retrieved October 6, 2014. ^ Giambusso, David (March 4, 2014). "Newark mayor's race: Baraka awash in labor union endorsements". The Star-Ledger. Retrieved March 5, 2014. ^ "Newark mayor's race: Baraka, Jeffries hold dueling events at city supermarkets". NJ.com. Retrieved October 6, 2014. ^ Nix, Naomi (May 19, 2014). "Mayor-elect Baraka and Booker agree to work together to benefit Newark". The Star-Ledger. Retrieved May 20, 2014. ^ Nix, Naomi; Friedman, Matt (May 21, 2014). "Christie, Baraka, DiVincenzo discuss Newark's future". The Star-Ledger. Retrieved May 20, 2014. ^ "Mayor elect Ras Baraka announces transition team". NJ.com. Retrieved October 6, 2014. ^ Bonamo, Mark (July 1, 2014). "Newark mayor's new chief of staff Amiri Baraka, Jr.: "I've got my brother's back"". NJ Politicker. Retrieved May 28, 2014. ^ "Newark's rebound". The Economist. September 21, 2017. ^ Augenstein, Seth. "Newark's kids' conditions improving, but they still lag behind rest of NJ: report". The Star-Ledger. Retrieved February 6, 2014. ^ "Judge Orders a State Takeover Of the Newark School District". The New York Times. April 14, 1995. Retrieved June 29, 2016. ^ Sullivan, Joseph F. (April 15, 1994). "Suit Seeks to Halt Newark Schools Takeover". The Star-Ledger. Retrieved March 5, 2014. ^ (Facebook Inc) (February 27, 2014). "Why Aren't Chris Christie, Mark Zuckerberg, and Cory Booker Defending Newark's School Chief?". Businessweek. Retrieved May 2, 2014. ^ "Startup:Education". Retrieved October 6, 2014. ^ Richard Pérez-Peña (September 22, 2010). "Facebook Founder to Donate $100 Million to Help Remake Newark's Schools". The New York Times. ^ Mooney, John (October 22, 2013). "EXPLAINER: WHAT'S BECOME OF ZUCKERBERG'S $100M GIFT TO NEWARK SCHOOLS". NJSpotlight. Retrieved April 15, 2014. ^ Severns, Maggie (March 28, 2013). "Whatever Happened to the $100 Million Mark Zuckerberg Gave to Newark Schools?". Mother Jones. Retrieved April 15, 2014. ^ "Is Christie-Backed One Newark Reform Plan Good For City's Students?". Forbes. March 31, 2014. Retrieved October 6, 2014. ^ Strauss, Valerie (April 19, 2014). "Clergy warn Christie: Your Newark school reform is a mess". The Washington Post. Retrieved May 28, 2014. ^ McGlone, Peggy (December 18, 2013). "Newark school restructuring includes plans to put charters in district buildings". The Star-Ledger. Retrieved February 1, 2014. ^ Mueller, Mark (February 25, 2014). "Newark schools chief warns of massive teacher layoffs; wants pink slips tied to performance". The Star-Ledger. Retrieved February 1, 2014. ^ McGlone, Peggy (February 12, 2014). "$100M for Newark school construction waits for approval". The Star-Ledger. Retrieved February 1, 2014. ^ Eidelson, Josh (February 18, 2014). "Christie's ed reform scandal: Principals suspended after questioning charter scheme "Narcissism," "dictatorial" and "totalitarian" tactics by Christie appointee, Newark councilman charges to Salon". Salon. Retrieved March 13, 2014. ^ Giambusso, David (February 22, 2014). "Newark mayoral candidate Shavar Jeffries hits superintendent, opponent in rollout of education plan". The Star-Ledger. Retrieved February 1, 2014. ^ Leonard, Devin (May 14, 2014). "Did Mark Zuckerberg Help Elect Newark's New Mayor?". Bloomberg Businessweek. Retrieved May 17, 2014. ^ Russakoff, Dale (May 17, 2014). "SCHOOLED Cory Booker, Chris Christie, and Mark Zuckerberg had a plan to reform Newark's schools. They got an education". The New Yorker. Retrieved May 17, 2014. ^ Goldstein, Dana. "Who Gets to Control Newark's Schools? A rabble-rousing new mayor wants to undo the reforms that Cory Booker, Chris Christie, and Mark Zuckerberg brought to town". Slate. Retrieved May 20, 2014. ^ Russakoff, Dale (May 19, 2014). "Schooled Cory Booker, Chris Christie, and Mark Zuckerberg had a plan to reform Newark's schools. They got an education". The New Yorker. Retrieved May 20, 2014. ^ McClone, Peggy (May 20, 2014). "At downtown rally, critics of Newark school plan present alternative". The Star-Ledger. Retrieved May 20, 2014. ^ "Newark, N.J., Schools Plan Opposed By Mayor-Elect Ras Baraka Takes Big Step Forward". The Huffington Post. May 14, 2014. Retrieved October 6, 2014. ^ "Newark mayor Ras Baraka tries to wrest control of the city's schools from Cory Booker, Chris Christie, and Mark Zuckerberg". Slate Magazine. May 21, 2014. Retrieved October 6, 2014. ^ "Newark, Paterson may have long roads to regaining full control of schools from state". NJ Spotlight. June 5, 2014. Retrieved May 28, 2014. ^ Cruz, David (June 30, 2014). "Anderson to Remain at Helm of Newark Schools, Activists Vow Ouster". NJTVOnline. Retrieved June 30, 2014. ^ McClone, Peggy (July 23, 2014). "Feds investigate claims of racial discrimination in Newark school reorganization". NJ Spotlight. Retrieved July 20, 2014. ^ "Baraka asks for Newark superintendent's resignation — again". Retrieved June 29, 2016. ^ "Newark leaders call Anderson's departure 'long overdue'". Retrieved June 29, 2016. ^ "Baraka calls Christie's charter expansion OK a 'huge step backwards' for Newark". Retrieved June 29, 2016. ^ "The Ras Baraka Blueprint to Redce Crime and Violence in Newark". rasjbaraka.com. 2013. Retrieved June 30, 2014. ^ "Newark mayor's race: Ras Baraka rolls out his public safety plan". NJ.com. Retrieved October 6, 2014. ^ Giambusso, David (December 28, 2013). "Newark Councilman Ras Baraka calling for gang cease-fire, increased police presence in wake of killings". The Satr-Ledger. Retrieved December 31, 2013. ^ Queally, James (December 31, 2013). "Newark mayoral hopeful wrote letters on behalf of notorious city gang boss, records show". The Satr-Ledger. Retrieved December 31, 2013. ^ Strunsky, Steve (December 29, 2013). "Baraka calls for gang ceasefire in Newark; mom seeks justice for son killed on Christmas". The Satr-Ledger. Retrieved December 31, 2013. ^ "Newark mayoral candidate faces blowback for writing letters in support of gang member". NJ.com. Retrieved October 6, 2014. ^ Augenstein, Seth (July 4, 2014). "Newark man gunned down before dawn is city's 44th homicide victim". The Star-Ledger. Retrieved July 4, 2014. ^ "Fixing Newark's neighborhoods a long-term initiative, report says". Retrieved June 29, 2016. ^ Dayen, David (May 8, 2013). "Newark's Terrible New Foreclosure Fix Idea Activists in the city think eminent domain can save their". The Nation. Retrieved May 28, 2014. ^ Atlas, John (June 30, 2014). "Working With Grassroots Organizing Groups, Ras Baraka, Newark's Mayor-Elect, Takes Steps To Help Homeowners". Huffington Post. Retrieved July 5, 2014. ^ Tyrell, Joe (May 9, 2014). "NJ STILL DROWNING IN 'UNDERWATER' MORTGAGES, NEW STUDY REVEALS". NJ Spotlight. Retrieved July 5, 2014. ^ Giambusso, David (February 19, 2014). "Newark Watershed: timeline of troubles". The Star-Ledger. ^ "Baraka calls for forensic audit of Newark Watershed". The Star-Ledger. March 2014. Retrieved July 8, 2014. ^ Wichert, Bill (April 24, 2014). "Newark fights court order to fund shutdown of watershed agency". The Star-Ledger. Retrieved February 28, 2014. ^ Mulshine, Paul (September 5, 2014). "Cory Booker: U.S. Attorney reported to be probing his watershed pals (Mulshine)". The Star-Ledger. ^ Dopp, Terrence & Versprille, Allyson (September 26, 2014). "Baraka Faces Newark's Challenges in Post-Booker Era". Bloomberg's Business Week. Retrieved September 18, 2014. ^ "Newark mayor Ras Baraka seeks transitional aid, state oversight". NJ.com. Retrieved October 6, 2014. ^ "Newark Mayor Announces Strategy to Reduce $93 Million Budget Deficit". rlsmedia.com. Archived from the original on October 6, 2014. Retrieved October 6, 2014. ^ "Newark to auction off dozens of properties, amid budget deficit (Map)". NJ.com. Retrieved October 6, 2014. ^ "State searching outside help to oversee Newark's finances". Retrieved June 29, 2016. ^ "State to cut Newark council members' expenses in half in effort to rein in city's spending". Retrieved June 29, 2016. ^ "Newark rolls out plans to rehabilitate two blight, crime-ridden neighborhoods". Retrieved June 29, 2016. ^ "Land for $1,000: Homeowner hopefuls flock to Newark Valentines Day Sale". Retrieved June 29, 2016. ^ "Here's what happened to those 100 lots Newark gave away last Valentine's Day". Retrieved June 29, 2016. ^ O'Sullivan, Jeannie (November 2, 2017). "Newark Mayor, Campaign Aide Hit With $396K ELEC Complaint". Retrieved January 22, 2019. ^ Yi, Karen (November 2, 2017). "Newark mayor accused of violating campaign finance rules". The Star-Ledger. Retrieved January 22, 2018. Mooney, John (October 25, 2013). "WOULD-BE SUCCESSORS TO CORY BOOKER OFFER VIEWS ON NEWARK'S SCHOOLS". NJ Spotlight. Moran, Tom (May 14, 2014). "Newark Elections: Cory Booker backlash bolstered Ras Baraka (Mulshine)". The Star-Ledger. Josh Dawsey, Leslie Brody & Heather Haddon (May 14, 2014). "Baraka Win in Newark Boosts Unions Other Beneficiaries Include New Jersey Mayor Fulop". The Wall Street Journal. Burroughs, Todd Steven (May 15, 2014). "An Election Analysis:Amiri Baraka's Son Becomes Mayor of Newark, New Jersey By Earning It". Gary Crusader. Tracey, Michael (May 17, 2014). "The Newark revolution was not televised Democratic regulars just beat down big Wall St. money to "seize power." Is Brick City too rough for media liberals?". The Daily News. Nix, Naomi (May 18, 2014). "5 things you might not know about Ras Baraka". The Star-Ledger. Henry, Samantha (May 18, 2014). "Newly elected Newark mayor inherits challenges". Miami Herald. Archived from the original on May 19, 2014. Retrieved May 19, 2014. Mieter, Siddhartha (July 1, 2014). "After Cory Booker Departs, a Radical Poet's Son Rises as Mayor of Newark Ras Baraka wants to reclaim New Jersey's largest city from charter schools and Wall Street". The Nation. Gillespie, Andra (May 16, 2014). "Election in Newark: Was Ras Baraka's win a referendum on Cory Booker?". NYU.